I never thought I’d say this, but after a 3-decade battle with acne, I eventually learned to love it. Well, not love acne itself – that would be a little crazy. But today I feel grateful for the role it has played in my life. I now see it as a “check engine light” that nudged me down the path better health. It started in 5th grade. My pot-bellied, glasses-wearing, freckle-faced self sat in band with my flute, next to the prettiest girl in my class. “You have blackheads on your nose,” she said. I didn’t even know what blackheads were, but I was mortified. As the typical breakouts of teenagerhood gave way to more stubborn hormonal acne during college, I saw dermatologists. Oral antibiotics, topical antibiotics, whatever I could get my hands on. I scrubbed my face multiple times a day with antibacterial cleansers, trying to keep it spotlessly clean. My towels and clothing were bleached by benzoyl peroxide. I obsessed over my acne, convinced it was all people saw when they looked at my face. 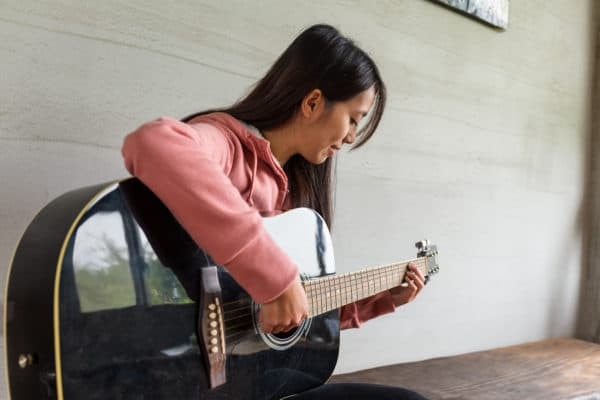 Somewhere in my twenties, I started taking hormonal birth control at the suggestion of my doctor, in part to regulate my erratic cycle, but mainly to control what had become painful cystic acne. If I exfoliated and medicated my poor face twice daily with Proactiv, then moisturized like crazy, then covered it all with a layer of carefully-applied makeup, I felt OK about how I looked. This carried on for about a decade; skin that was never clear, yet never completely out of control. Occasionally I’d have a flare up, and I’d visit a dermatologist to be given a prescription for antibiotics – the only solution ever offered. One dermatologist put me on powerful antibiotics for over a year at one time (I won’t even go into the gut troubles this caused). Was it something in my diet causing the acne, I asked at one checkup? The doctor shook his head, not acknowledging that he didn’t actually know what was causing it – he only knew which antibiotic to prescribe. I married my sweet husband when I was 35. After we’d been married a little while, we wanted to have a family, so I began reading about how to be healthy during pregnancy. I kept coming across articles about cosmetics, fragrances, and other personal care products – specifically, the chemicals in them. How everything you put on your skin is absorbed into your body. How benzoyl peroxide is not safe for babies, and neither is salicylic acid; and really, there isn’t much you can safely put on your skin to treat acne because it could all end up getting to your baby. Having quit birth control, and having given up many of the harsh facial care products I’d been using, I began to experience horrible, painful, out-of-control breakouts. The kind that hurt so badly, I took ibuprofen for weeks at a time and could only sleep on my back because I couldn’t stand to have a pillow touching my face. The kind that leaves scars. One day I finally wondered, WHY do I have acne? I’d done everything in my power to get rid of it, but it was worse than ever. I’d spent unlimited time, energy, and money trying to find the perfect product or prescription to cure it, but I hadn’t yet thought about how I might prevent breakouts in the first place. I began trying to get to the root of what was causing my acne, and so began taking steps toward a more holistic approach to wellness. I confess that this search was motivated, initially, by the vanity of wanting to have clear skin. Or at least, skin that wasn’t full of painful, angry-looking red spots and scars. I eventually discovered the combination of things that were causing my acne and what to do about it. Read about my holistic strategies here. 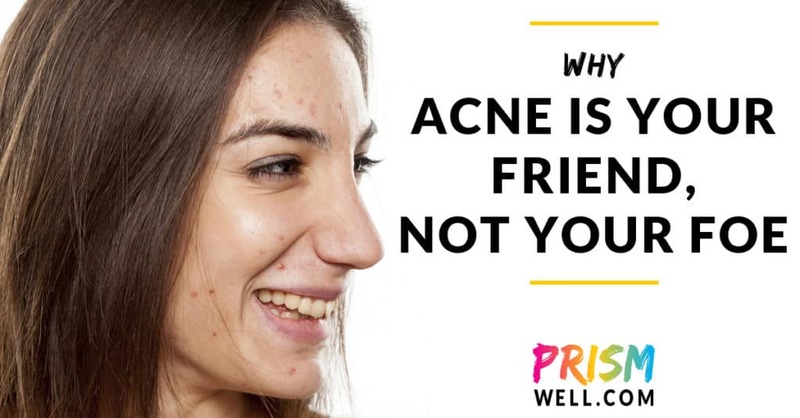 But what I now know about acne, that I wish I could go back and tell my younger self, is that acne is one of the body’s ways of trying to let us know it is struggling. Like many other chronic symptoms we experience, acne is a red “check engine light,” right where we can’t miss it. If we try to get rid of the symptom, the underlying problem causing that symptom will have to find other, bigger ways to get our attention. If you have acne, you have an important clue, straight from your own brilliant self, that your health needs help. Here’s a great way to find out what it might be telling you: read about Chinese Face Mapping. And since the skin is the body’s largest detoxification organ, acne could also be a sign that your body is having trouble with detoxification.